It seems Italian design duo Stefano Gabbana and Domenico Dolce have a weird obsession with China. One which nine out of 10 times offends the Chinese. Dolce & Gabbana concluded 2018 with a canceled show in Shanghai, China due to their "chopstick eating" video series that perpetuated racial and cultural stereotypes against Chinese people. You would think that would've been a wake up call for the luxury label, but apparently not, because what gives your brand more attention than a little controversy, right? It therefore comes as no surprise that their latest offense against the Chinese community happens around the Lunar Chinese New Year holiday. 2019's Chinese New Year ushers in the year of the pig - an animal associated with luck, fortune, personality, and romance on the Chinese zodiac. However, D&G's interpretation has not been so positive... well at least not to anybody else besides the designers. A twinset with a pig illustration presumably making reference to a piggy bank and therefore fortune, was spotted on their website. The pig on the cartoon is flashing a few dollar bills and 'DG' coins - neither of which are Chinese currency, portraying a complete disregard for the culture they feign to be so enamoured with. Instagram account Diet Prada, as usual did not hesitate to interrogate the matter and serve us the piping hot tea soon after. Of course, Stefano Gabbana does not consider their ode to the Lunar New Year tone deaf at all. In what appears to be responses to a Dieter, this half of the design duo remarks that "[the post] was deleted from Chinese social media because my office is stupid as the superiority of the Chinese..."
"And from now on in all the interviews that I will do international I will say that the country of [insert poop emojis] is China.. and you are also quiet that we live very well without you," he continues in the next message. "China Ignorant Dirty Smelling Mafia." We actually have to laugh in disbelief. Not only are Stefano's retorts to the backlash he receives from China's cyber community blatantly arrogant, they are also incredibly racially charged and inexcusable. The mind truly boggles at how such a once globally acclaimed fashion label continues to be so repeatedly obtuse. 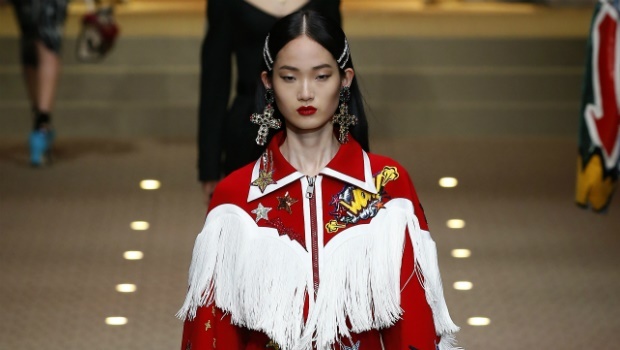 At this point, we have to assume it's deliberate and that Dolce & Gabbana is trying to get permanently banned from China. And from our wardrobes. We hear you Chrissy Teigen.